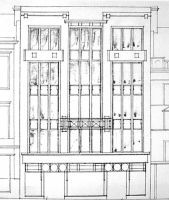 The tall, narrow façade of the Salon would have been a striking sight when it opened in Sauchiehall Street in June 1913. At a time when cinema architecture was still in its infancy, and tended to borrow heavily from traditional theatre design, the Salon, attributed to architect Thomas Baird Jr., would have looked like no other building in Glasgow, cinema or otherwise. The entrance from the street was through a large central door, framed by pillars at either side, with a massive Moorish arch containing three windows above. The Moorish theme was repeated over the rest of the façade, mostly clad in diagonally set square tiles, and framed, almost proscenium-like, by an elaborate band of scrollwork. Click here for a detail of the 1913 exterior plan. The name was displayed centrally above the arch, and above the whole of this was a full-width balcony, with even more elaborate scrollwork adorning both its front, and above the 9 tall windows which looked onto it. Finally, the roofhead was lined with a row of small castle-like pediments, shaped like crosses, which continued around the sides. Inside, the auditorium, seating 950 in stalls and balcony, appears to have been at ground floor level, with a small foyer. The auditorium was tall and narrow to make best use of the narrow site. Above the auditorium, a remarkable café area was built, which continued the Moorish theme of the façade. At the northern end of the café, a tripartite archway echoed that of the main entrance, but additionally featured the larger central arch being flanked by two smaller ones at either side. Balconies overlooked the café on either side, these being split into small bays with curved balcony fronts decorated with iron railings. Above, a barrel-vaulted ceiling provided natural illumination with large glazed portions in both that and the external roof above, the interior glazing being coloured. The whole café area was advertised as a Winter Garden and Tea Lounge, so presumably the whole area was decked out with exotic plants and shrubs. The cinema operation does not appear to have been very successful, with the building gaining something of an ill-reputation, and it is reported to have closed after less than 10 years of operation, in May 1923 . The fate of the cinema after that is detailed in a rather vague and confusing set of plans dated 1924/5 . These include plans of the building as it was at that point, as well as the proposed plans for its conversion for retail use. Some of these are intriguingly attributed to a W. Inglis – could this have been Glasgow architect William Beresford Inglis, designer of the Beresford Hotel, and several atmospheric cinemas in the city, including the Toledo in Muirend? The façade of the building was totally altered into a more traditional frontage for the period, finished in plain white masonry, and split vertically by three narrow glazed sections running almost to the full height of the façade. Small balconies adorned the outer two of these sections at the upper-most level. The plans from these alterations also show the central entrance being replaced by a small arcade, with a central glass display case, but a photograph of 1937  (when the ground floor was occupied by Cooks furniture shop) shows a single, more conventional recessed doorway in the center, flanked by two large glass displays. The 1937 photo also shows a new close formed at the left of the ground floor, which provided access to both a lift and small staircase to the upper floors. This appears on only some of the 1924/5 plans, seemingly having been a late addition to them. The more elaborate main staircase, which had previously provided access to the cinema balcony, was swept away in these conversions. Sadly, the cinema auditorium itself was also obliterated at this time, with the stalls floor leveled and three new floors inserted above it. The café and Winter Garden, however, seems to have escaped lightly, and this area survives today as the least altered part of the original 1913 design. The alteration plans have the name “Lumley” as the commissioner, and after the conversion, the building seems to have taken the name Lumley House. Interestingly, an early photograph of the cinema when it was still in use  show Lumley’s to be the adjacent premises, above what is now Lauder’s pub. This would suggest that they took the opportunity to expand when the cinema became vacant. The top floor café area, however, appears to have been a separate concern, and is shown in photographs in the 1930s as The Piccadilly Club . This was entered from the newly formed close at the ground floor, and is also advertised on signage at the rooftop level. The history of the building after the 1930s is, ironically, less well-documented. As of October 2004, the ground floor is occupied by a Rangers store. A Chinese restaurant is on the first and second floor levels. A nightclub, now called Moon, has been operating from the upper floors for many years now, although its older name of Rooftops is still displayed in the windows. This uses the uppermost of the 1920s inserted floors, as well as the two level original tearoom. As has been the case since the mid-20s, access to the upper floors is still from the close at the side of the ground floor, where the staircase winds its way up around a lift shaft. It has previously been thought that no original decoration from the cinema was intact, but thanks to dedicated efforts of the staff in the nightclub, some surprising survivals have come to light! On the lowest level occupied by the club (which is on the uppermost of the new levels built in the 20s), a false ceiling hides a rather unusual ceiling of decorated panels made from what appears to be pressed copper or brass. This level would have been the original auditorium ceiling, but it is not clear whether these panels are from then, or date from the 1920s alterations. Best of all, however, the upper club floors now occupies the space where the café once was – and this area has much of interest going back to the original 1913 design, if one is prepared to look beyond the gaudy mirrored tiles and lights of the current décor! As mentioned, this area was The Piccadilly Club in the 30s, and is also said to have been a casino at some later point. Amazingly, it still retains the balconies at either side, and the upper bays have curved, decorative metal railings, although it is unclear whether these are from 1913, or the later 1920s rebuild. Pillars in this area also sport highly decorated tops, including two supporting an otherwise plain arch at the southern end. Once again, though, it is above false ceilings that the best evidence is found. At the northern end, a magnificent, parallel pair of Moorish arches are still to be found, hidden behind wooden paneling and the clutter of modern electrical wiring. A larger central arch strongly echoes the original Moorish arch on the façade, although this one is much more detailed, lined internally with a double row of teeth, and is flanked by two similar, smaller arches. Presumably this would originally have been mirrored by similar arches at the southern end, where the now plain archway is. In between the two northern sets of arches, a small portion of the barrel-vaulted ceiling also survives, lined with decorated panels. Tantalising glimpses of the decoration that must have once continued down to floor level are also visible. As for the main, glazed ceiling of the café area, sadly this has largely been destroyed. All around the roof void bubbled paint, charred timbers and melted lead attest to the destruction of this ceiling by fire at some unknown point, although the main curved plaster ribs are still in situ, and appear to show signs that they once had small, decorative features attached to them. Even some coloured glass is still evident in the corners of some of the roof trusses, although the main exterior roof glazing has been painted over and covered with metal sheeting since the fire. Externally, the façade of 1924/5 has been simplified further at some more recent point, with modern glazing introduced, and the twin mini balconies at the top of either side removed, with the result that the building today has changed so dramatically from its original appearance that unless you look up and see the high peaked roof of the auditorium, you would never guess that it was once one of Glasgow’s earliest, most individual cinemas. A large gallery of photos from various parts of the interior of the Salon may be seen here. Many thanks to Sandy Forbes and the Moon Nightclub management and staff for their time and enthusiasm!